In 1900, the U.S. census counted only 470 American Indians in Texas. In 1990, there were 65,877. American Indian dances in Grapevine. The statistics belie the fact that there is a much longer history of Indians in Texas. The state is filled with Indian names, as evidence – Cherokee County, cities like Waxahachie, Anahuac and Nacogdoches, and places like Caddo Lake and Comanche Peak. Obviously, the 20th century has seen the return of a culture to Texas. American Indian dances in Grapevine. All these terms have been used to describe the various indigenous groupings that populated this region. Some, like the Karankawas and Jumanos, show up only briefly in modern history, having disappeared about the time of the first European settlement. Often, two named "tribes" encountered by adventurers were actually the same tribe but labeled differently by French and Spanish. In prehistoric times – as far back as 37,000 years ago, some anthropologists estimate – primitive peoples who are the ancestors of modern American Indians existed in Texas. A burial site in the Permian Basin, dated to 12,000 years ago, was discovered in 1953 and the skeletal remains labeled "Midland Minnie." Lubbock Lake park is at the site of a primitive civilization dated to 12,000 years ago, as well. These early migrants arrived here possibly by crossing over the land bridge between Alaska and Asia and moving south. Scholars say that in 1492 nearly 10 million natives inhabited North America, but by the middle of the 19th century this population had dwindled by 90 percent. In 1830, according to Walter Prescott Webb, there were "more Anglo-Americans in Texas than there were Mexicans and Indians combined." It should be kept in mind that all these figures on "Indians" do not include descendants of the indigenous people who were enculturated or Christianized and mixed into la raza. The Institute of Texan Cultures puts it well: "It is almost forgotten that through many Texas families there runs a strong strain of Indian blood. Texans of Mexican heritage are descended from the proud peoples who created great civilizations south of the Rio Grande long before the Spaniards came," says The Indian Texans, a booklet published by the institute. Never static, the aboriginal populations pushed and shoved each other from territory to territory. By the time Europeans arrived, there was never simply one frontier of European and Indian. It was much more complex. It was more a matter of Spanish-Anglo-French-Comanche-Caddo-Apache etc., frontiers. Major players in the drama of 19th-century Texas were definitely the Comanches who at this time swept down from the cool highlands of the southern Rockies, and, mounted on horses, drove other tribes from West Texas. Lipan Apaches were principal victims in this new arrangement. To a lesser extent, Tonkawas and Wichitas were caught in the battle over territory above the Balcones Escarpment, where the Texas Hill Country begins. The only other group to have inhabited western Texas, the Mescalero Apaches, left for Mexico or for the New Mexico reservation in the 1870s. In January 1881, a band of Mescaleros raided a stagecoach in Quitman Canyon in Hudspeth County. "Texas Rangers pursued, killed eight, and dispersed the rest. This was the last Indian fight on Texas soil." (The Indian Texans). About a quarter century before the 1900 census count, the last major military campaign against Indians occurred following the Battle of Adobe Walls in the Panhandle. On June 27, 1874, a Kiowa and Comanche war party led by Quanah Parker attacked buffalo hunters encamped in the abandoned trading post on the Canadian River. At the end of the encounter, three hunters were dead and 13 Indians killed. This battle spurred the military action of 1875 that forced the last Indians living east of the Pecos River into the Oklahoma territory. This kind of forced migration into Oklahoma had occurred decades earlier in East Texas in another historic moment – the Battle of the Neches in Van Zandt and Henderson counties, near present-day Chandler. Here, in 1839, it was the armed forces of the Republic of Texas against the Cherokee people led by Chief Bowles, also called Duwali. These Cherokees had been pushed into Texas from the southeastern United States after the War of 1812 by the U.S. government. At the same time, a policy of welcome from Spanish officials, who wanted a buffer to Anglo-American migration, drew the Cherokees to land northeast of the Trinity River. Despite the conciliatory influence of Sam Houston, Texas President Mirabeau B. Lamar was able to enforce his hostile Indian policy and drive the Cherokee farmers north across the Red River. In the decades between this East Texas battle of 1839 and the Adobe Walls battle of 1874, few public lands were reserved for Indians. Unlike other states in the U.S. West, the federal government did not have public land in Texas to give to the Indians. The Texas legislature made 53,000 acres of land near the Brazos River available for two reservations in 1854. However, Clear Fork Reservation and Brazos Reservation near Fort Belknap soon encountered suspicion and hostility from white settlers in the area. In 1859, the Comanche remnant at Clear Fork and the Tonkawas, Wichitas and the Caddo remnant at the Brazos Reservation were forced north across the Red River into Indian Territory. Long before Anglo-Americans and these Plains Indians of West Texas encountered each other, the Spanish missions of South and East Texas impacted other groups of natives, most prominently the Caddoes. In 1690, the Caddo confederation of East Texas became the focus of the missionary zeal of Franciscan friars. These Indians were part of the mound cultures that surround the Gulf of Mexico from the Yucatan to the less-developed groups of the southeastern United States. The Caddoes were a sedentary, planter people. One of the Caddoan tribes, called Tejas by the Spanish, is the origin for the name Texas. Coahuiltecans in South Texas were the impetus for the San Antonio missions. The European diseases to which they were not immune diminished their number. Comanches and Apaches killed many more. And the rest were absorbed into the Mexican people. Other Indians such as the Tlaxcalans were brought up from Mexico by the Spanish Franciscans to help establish the missions. These Indians are a primary example of those who became enculturated, and their descendants still live in South Texas. There are three reservations in Texas today. The oldest is the Alabama-Coushatta Indian Reservation in Polk County in southeast Texas, where some 650 live. These Creek remnants were forced into Texas from the southern United States and later allied with the cause of Texas independence from Mexico. They were the only group ever able to have Republic, state, and federal governments sustain guarantees to certain land. The two other tribes – both along the Rio Grande – received state legal recognition only since 1960. These two groups arrived in Texas after the arrival of Europeans. The Tiguas, who moved down from the area around present-day Albuquerque, live on trust land in El Paso County, and, in 1994, tribal rolls listed 1,463 members of one-eighth blood quantum or greater. The Kickapoos, originally from the Great Lakes region, received land in 1985 for a reservation south of Eagle Pass, but the semi-nomadic people continue to move each year from Mexico to the southwestern United States as hired farmworkers. They spend the winter months at the small reservation. There are about 650. Starting in the 1950s and until 1980, the federal government resettled as many as 40,000 Indians in the Dallas-Fort Worth area in a program of integration into the wider American culture. For many of these Indians, the program was only a brief experiment in urban life. Most chose to return to their reservations in other states, but many stayed and provided the core for the resurgence of American Indians in Texas. Today there are about 20,000 urban Indians in the Dallas-Fort Worth area, and the majority of the other Indians in Texas are living and working in urban environments, although most counties number a few American Indians among their citizens. American Indian culture is celebrated in many different powwows and other festivals. The powwows are gatherings where participants dance to the beat of drums accompanied by chants. Chandler, the site of the Battle of the Neches, has an annual Duwali Hoop the last weekend in September. It includes Indian food, archery competition and tours of historic Native American locations. More than 5,000 meet every year at the Texas Red Nations Powwow in Dallas. The event is held in November. Grand Prairie stages the National Championship Powwow at Traders Village in early September. In Crowley, south of Fort Worth, the annual Texas Kiowa Tia-Pia powwow is held in early May. The Inter-Tribal Council of Houston has its annual powwow in May. Laredo is the site of an annual powwow the last Sunday in May. San Antonio plays host to a powwow in July. In Corpus Christi, the Coastal Bend Council of Native Americans holds its annual powwow in the early fall. The Texas A&M University Native American Student Association sponsors a powwow at the College Station campus each February. In November, the Austin Independent School District sponsors a celebration the first Saturday of November. The Alabama-Coushatta Indian Reservation between Livingston and Woodville stages an annual powwow the first weekend in June. Other cultural events around the state include the St. Anthony Festival in El Paso. The Tiguas, for whom the Ysleta del Sur Pueblo was established in 1681 and one of the oldest ethnic groups in Texas, honor their patron saint with ceremonies, authentic dances and ethnic foods. Visitors are also welcome at the Tigua and Alabama-Coushatta reservations all year. Palo Duro Canyon State Park near Canyon is the site of the Kwahadi Indian Summer Ceremonials in early October. In Post, the annual Indian ceremony for crops is in late March. A Plains Indian dance is performed at sunrise the day after the first day of spring. The wind's direction at sunrise determines success of the coming year. There is a traditional ceremony and early-morning breakfast. Indian arts and crafts are celebrated at two North Texas events each year. Downtown Dallas is the site of the annual American Indian ArtFestival & Market in October. And in Fort Worth, the Museum of Science and History hosts the annual Shared Worlds: Native American Day each October. 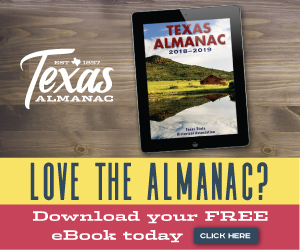 —	written by Robert Plocheck for the Texas Almanac 1998–1999. • England, Nelson, "Urban Indians: Trails of Hope," Texas Highways, October 1995. • Institute staff, The Indians of Texas, Institute of Texan Cultures, San Antonio, 1970. • Newcomb, W.W. Jr., The Indians of Texas, University of Texas Press, 1961 (Fourth Paperback Printing 1978). • Utley, Robert M., The Indian Frontier of the American West 1846-1890, University of New Mexico Press, 1984. — Photo by Lisa LeVrier.